Accra, Nov. 6, GNA - Former President Jerry John Rawlings on Saturday electrified the main opposition National Democratic Congress (NDC) Greater Accra regional rally in Accra. The Former President, who arrived at the rally ground at the seafront 'Mantse Agbona,' at 1455 hours with the Former First Lady Nana Konadu Agyeman Rawlings immediately mounted the dais and greeted the thousands of enthusiastic party supporters with gestures of victory. 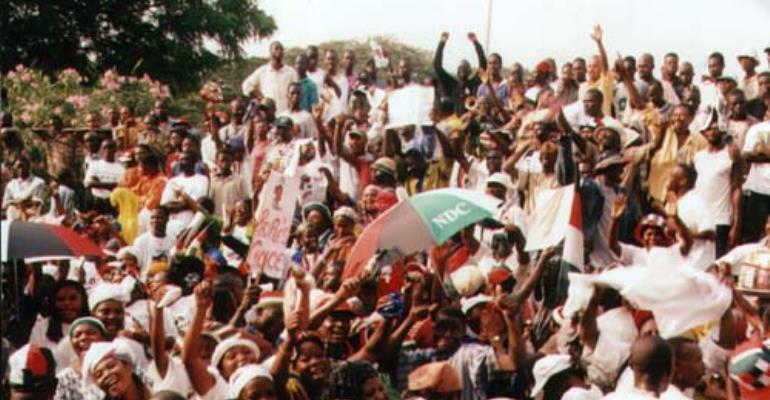 The supporters and sympathizers responded with waving of NDC miniature flags and other party paraphernalia. Former President Rawlings said the Government of Prof John Evans Atta Mills would teach the masses how "to fish and rescue the country from further injustice, mismanagement, nepotism, cronyism, corruption and neo-colonialists policies. He predicted that the economic and political injustices of the New Patriotic Party (NPP) Government would end on December 7. Former President Rawlings observed that the NPP's campaign slogan for the 2000 Elections urging the electorate to reflect on their living conditions before casting their votes provided the basis for voting them out of office this year. Former President Rawlings said corruption and bad economic management by the Government had impoverished most Ghanaians. The rally, was organize to sharpen the popularity and image of the Party, particularly to project the NDC's Presidential Candidate, Professor Mills, as well as introduce the Party's 27 Parliamentary Candidates in the Greater Accra Region to the electorates. As has been the usual spectacle at such events, the entire area, including the adjoining streets turned into a sea of NDC paraphernalia with some activists decorating their bodies with Party colours to show that they were proud followers of a major opposition party.